Sidewinders Sock I | carpe diem! 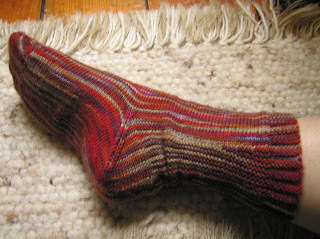 Pattern: Sidewinders Socks, a play in V Acts from Nona. Yarn: Socks That Rock lightweight in Rooster Rock. Comments: Got gauge (gauge is crucial) on a 2.5mm circular, which produces a slightly looser fabric than I’d normally knit (I prefer 2mm). No matter, the fit is PERFECT and I love this sock. 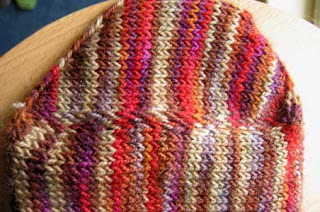 It’s a witty, elegant pattern (the toe shaping is wonderful) that really shows a handpaint yarn to perfection. Nona’s instructions are almost foolproof; I managed to mess up the toe the first time round (I should have placed the marker one stitch from the edge, not two), which means I’m late finishing but did give me the chance to relax a bit and thus improve my gauge. I was getting a bit tense by mid-sock as my competitive spirit rose to the challenge of finishing each installment in time for the next. I spent over two hours grafting this morning, but part of that was re-working the toe graft three times. It’s the first time I’ve worked across the stitches: my first attempt resulted in a tidy line of purls across the right side, the second was an almighty mess, and the third I can live with. I’ve posted a picture for those who don’t know what it could look like; I’m not certain this is what it should look like, but I think it will even out a bit after washing and wearing. Life is about to get very interesting indeed. I’m on holiday at the end of the month, my annual large typesetting job started landing (late!) a fortnight ago, another large project has just announced a tight deadline, and all the little projects are crying because they want to play too. My Ravelry invite arrived (which means cataloguing my stash for the first time), I’m not yet finished spinning that [expletive deleted] alpaca/silk for my mother’s scarf/shawl, I’ve got silk to spin for me, I’ve got some Addi Turbo lace needles petitioning to be introduced to Sundara’s silk and the gift shawl… and all I can think about are Sidewinders Socks: a PERFECT PerpenSOCKular pattern. Get thee behind me, Satan… too late. Nona, would you write me a note to explain why I’m late for work? This entry was posted in Uncategorized on June 12, 2007 by sarahw. That’s a beautiful sock! Love how it turned out. That is stunning! I wasn’t at all interested in the pattern when you first mentioned it. Now I’m wondering…pretty seductive, huh?I wish you luck with all the myriad projects. It sounds as though it will be a tough haul but at least you have vacation to look forward to at the end of it! Clever you! Great looking socks but TWO HOURS grafting -what were you thinking! I love the toe ups because they don’t need two minutes grafting! My head would be spinning right about now. OMG, you’ve got a boatload of work ahead, but I am confident in your abilities as you sprint to the finish line and your well-deserved holiday. Wearing you fabulous Sidewinders, naturally! OMG! it is fab! you are so fast, I can’t believe it. they are on my “knit this summer” list. I really like your colorway. Great job with your sock — I’d be happy to write you a “late for work” note. Your horiztonal graft looks good. I found grafting the horiztonal seam from the inside created the most comfortable join, although is does create a small line of purl bumps. On my sock the purl bumps were hidden by the edge stitches. When it rains, it pours! 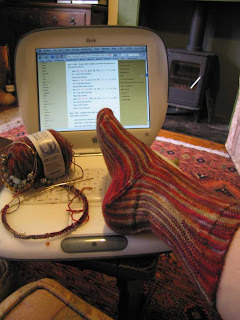 I hope you are able to get all of your projects done, as well as some knitting time. Where will you be going for your holiday?I’ve posted some reports on the GYGIG ride on my blog, if you are interested.